The pursuit to develop English Language skills amongst students is a very healthy consideration, apparent of the global scenario. This interest in the English Language is due to knowledge resource available. Youngsters learn through a natural process without embarrassment or fear. We at Sant Tukaram National Model School believe it is the right age to mould the student by developing the essential skills of life and language, nurturing confidence for the years to come. 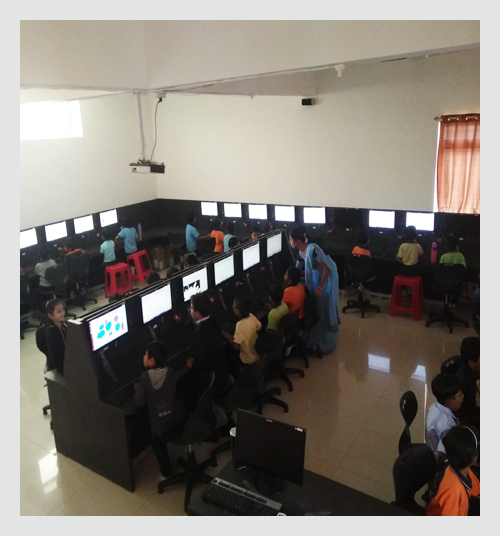 Hence the school has set up an English Language Lab with 36 well equipped computers and has been started since June 2012 for our young brains to enhance their listening and speaking skills. English Language Laboratory is an audio or audio visual installation used as an aid in modern language teaching. School has been using Words Worth English language Lab software since June 2012. It is designed for India and is a highly researched initiative of the ACTUniv Group, an ISO: 2008 company certified enterprise and a trusted education company with 2 decades of service in technology education and training. Words Worth is a unique English learning programme that prepares the participant to communicate in English with clarity and confidence. It offers the best in terms of continuous evaluation, content, teaching expertise and methodology. The methodology is a blend of Instructor Led training (ILT) with a Computer Based Training (CBT), practice and evaluation. The sessions are designed so that the course follows a parallel- structure in which concepts are introduced in the ILT session, and reinforced with practice and an innovative approach to learning in the CBT session. Familiarity of Technology & the joy of learning….Integrated.